Governor Brown’s Office of Business and Economic Development (GO-Biz) has launched what it calls a “one-stop shop website” for business owners looking for information and assistance. The website, BusinessPortal.ca.gov, consolidates information on starting a business, state permits and regulations, and incentives. The business community has been vocal about its need for better online tools to navigate California’s regulatory environment. GO-Biz officials think this site helps answer that concern. 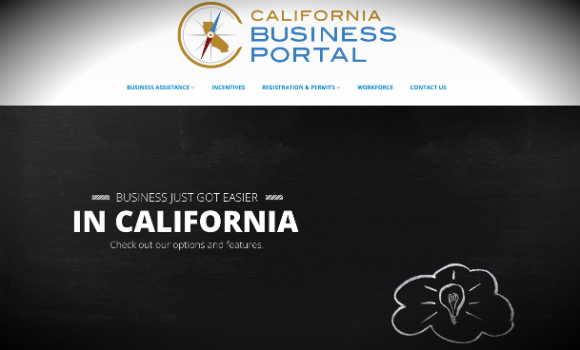 “California business owners now have a resource to make it easier to do business in the state and GO-Biz will continually update the portal to ensure it keeps up with the demands of business owners and entrepreneurs,” said GO-Biz Chief Deputy Director Panorea Avdis. GO-Biz began building the framework for the business portal in the fall of 2014. They emphasize that it was developed and produced in-house using existing resources. Spokesman Brook Taylor said today that the website will evolve and expects a “phase two framework” will be developed in six months or so. That evolution will be fueled by feedback that they receive from users. Taylor pointed out the service desk feature on the website is designed to not only answer basic questions that business owners and entrepreneurs may have but also to elicit questions that aren’t being answered on the site. “Those questions will get a customized and personalized response from us,” Taylor added. Of course, GO-Biz is not on the only the state agency that impacts operating business in the state. There’s the Secretary of State’s office where you to go start (or dissolve) a business, the Franchise Tax Board (where you pay taxes), and the Employment Development Department (hiring, training and unemployment). The goals of the new portal are to answer basic questions, expand the site's scope to other state agencies and business organizations, and make it easier to navigate the labyrinth of the state regulatory infrastrucutre. Taylor indicated that business partners have been involved in helping develop the site and will be counted on as they work to improve it. "This website is a positive step for California. We've been hearing for years that the state needs to make it easier for businesses to obtain basic information as they start and expand in California," said Susan Lovenburg, CA Fwd's director of the Partnership for Economic Prosperity and the California Economic Summit.